More than a luxury, massage has become alternative medicine as part of a holistic treatment plan. It stands to reason that if massage relaxes you it has to be good for stress. Not all doctors accept alternative medicine as a legitimate benefit. But you do the math. If an alternative treatment cures your ills, why wouldn’t you try it? In a recent study, 77 percent of respondents said their primary reason for getting a massage was not for the relaxation primarily, but instead because of medical or stress related problems. A survey by the American Hospital Association found that 80 percent of hospitals surveyed used massage therapy as an alternative, and more than 70 percent offered massage therapy for pain management. And you can reap the benefits right in the comfort of your home with a mobile massage Fort Lauderdale. There is a lot of moving parts involved with massage therapy involving gentle touch or forceful touch. You may be fully clothed and sit in a specially designed massage chair for concentrating on the neck and arms, or without clothes, covered with a sheet lying on a table. Experts acknowledge, although it is not widely understood how massage works, that it does work. Theories abound as to the true mechanism with some offering that massage slows the production of cytokines, which contribute to inflammation, and stimulate the mitochondria which provide energy to the body. Another contributing benefit that has been widely touted as a possible side benefit is the reduction of cortisol which in abundance wrecks havoc on the sympathetic nervous system. There have been many reports that massage therapy is generally effective for chronic back pain. One therapist in Massachusetts says that most of her clients come to her because of non-specific pain in the back, neck, and shoulders. Other patients seek massage therapy relief when dealing with cancer and chemo, or panic attacks and depression. Other health issues that can be assuaged by massage include fibromyalgia and irritable bowel syndrome. Even more impressive, massage offers help from migraines, insomnia, and wound healing due to increased blood flow after surgery. Massage therapy benefits young and old. It is suggested that clients with a chronic illness and/or chronic pain seek out a reputable, licensed therapist who specializes in medicinal massage therapy. A professional therapist will talk with you and determine the right massage for your needs. A serious health issue can definitely make it easier with mobile massage Fort Lauderdale. In order to ascertain the best massage treatment approach, the therapist will take a few minutes to discuss medical conditions, symptoms, and what type of outcome is expected. In addition, your therapist will normally evaluate any areas of pain and probe gently to see how much pressure can be tolerated in painful spots. Clients will generally wear loose fitting clothing or remove all clothing and be covered by a sheet during the session. Some clients will opt for a chair massage. Sessions last from a few minutes to an hour or more. Although science is unable to pin down what massage actually does, and, therefore, some are hesitant to agree with massage as medicine; however, anecdotal evidence tells another story. There is no denying it works. Massage can make a difference in one session with certain conditions. Numerous studies abound showing a large body of evidence for the effectiveness of massage for chronic back pain, cancer pain, and depression. Some theorize that massage may relieve pain by stimulating the release of chemicals in the body that block the pain signals and the feel-good hormones serotonin or endorphins. We know you are busy, but you deserve some pampering so we come to you. Or perhaps you need a health boost but can’t come to us. Massage is useful for relieving a wide array of health conditions, many of which render you unable to leave your home, or do so at great personal cost. In some cases, the benefits of massage may even be lost due to the discomfort or effort needed to travel to a massage location. Mobile massage Fort Lauderdale makes everything easier for you and since your comfort is our business, it’s a service we gladly offer. You don’t have the hassle of traffic making you all keyed up when you are supposed to relaxing. You are tired after work so the last thing you want to do is head to the massage clinic. With no stress, you can go home, change clothes, have dinner, and put the little ones to bed. Then it’s time for you. We are open late so that you are able to relax without worrying what is still undone. Perhaps you are in town for business or vacation and you don’t know the area well. Instead of tracking us down, we will bring the massage to you right in the comfort and privacy of your hotel. How about a massage party? Massages are great for get-togethers. How about treating your bridesmaids to a relaxing massage to thank them for helping out? A massage is an awesome bridesmaid’s gift. Book your favorite massage therapist in Fort Lauderdale for an entire day or evening for one of these events. Some new massage party trends are Movie and Massage night, or just a plain massage party because a massage can stand on its own as a reason for a party! So imagine all your girls hanging out and getting a relaxing massage. 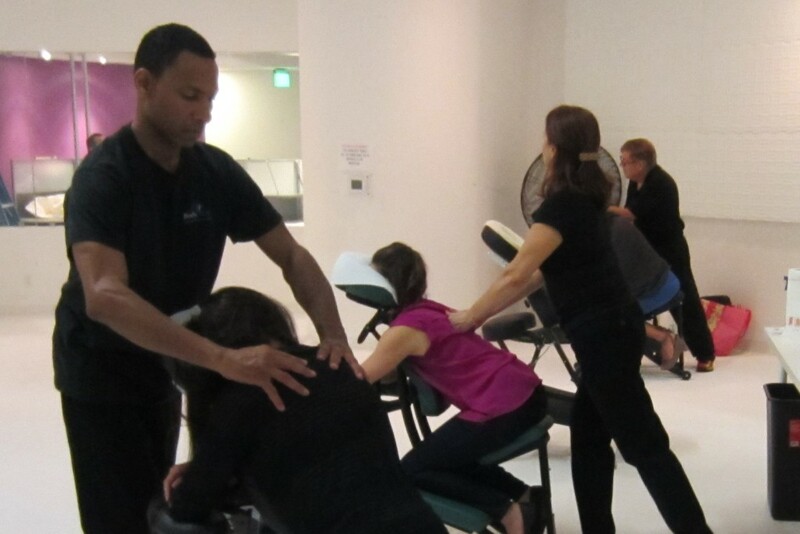 Other party planners will be hard pressed to top a massage party. It is appropriate, I think, that our name should be Body Well because massage can truly make your body well. Located in Fort Lauderdale, with many years of business serving Fort Lauderdale and surrounding areas, we are part of your neighborhood. Many times you will find some massage companies only provide service to businesses and hotels; however, at Body Well, we also provide these services and more. We work with individuals, house parties, and other situations. We do all that we do to make you into a better you.